Recently, an interesting exhibition dedicated to genre painting opened at the Galleria Palatina. Around thirty paintings of this type from the Medici collections are on exhibit (17th-18th century). At the time considered a “minor” form because of having so little in common with the Academy of the great masters – these are workday scenes, often focusing on bizarre, comic and sometimes grotesque aspects of everyday life. A “lesser” humanity is the protagonist of this genre: clowns and dwarves (of the court), but also characters marginalized by society such as the crippled and homeless, or gamblers, con-men, and pimps. The unique characters in this exhibition actually existed. Their job was to entertain the Medici court, and their guests, on a variety of occasions, or simply when boredom prevailed. These characters include the dwarf “Nano Morgante”, portrayed by Bronzino and Valerio Cioli, the “Meo Matto” and “the peasant woman Domenica from the Cascine” portrayed by Justus Sustermans, but also a whole host of characters known for their wit, jokes and sayings. They were treated as (curious) objects in the Medici collection, to be shown as attractions, authentic amusement machines there for the entertainment of their masters. Behind the apparent lightness of these often humorous “little scenes”, a moral meaning with educational intentions was often concealed. Some of these representations, to achieve a humorous effect, played on the principle of contrasts. 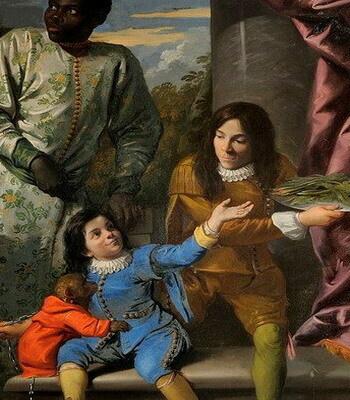 This is the case, for example, with the fine late 17th-century painting (uncertain attribution) in which an old woman in a wedding dress pathetically courts a young boy, and is then discovered by an impertinent dwarf. Also notable is the painting “Four Servants at the Medici Court “ (around 1685) by Anton Domenico Gabbiani.